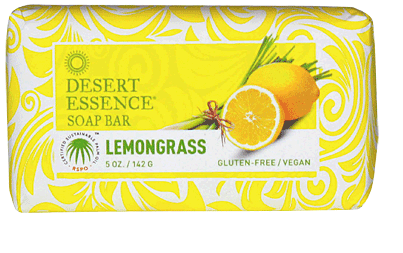 This creamy, naturally scented bar gently cleanses skin, leaving it smooth and silky to the touch. Made with sustainably harvested palm oil, it revitalizes skin with the inherent astringent properties of Lemongrass Oil while uplifting the senses. Aloe Vera and Jojoba Oil moisturize and soften. Made with 100% RSPO Certified Sustainable Saponified Palm Oil and Palm Kernel Oil, Water, Glycerin, Lemongrass Oil, Jojoba Seed Oil, Aloe Vera Leaf Juice, Salt, Citric Acid.